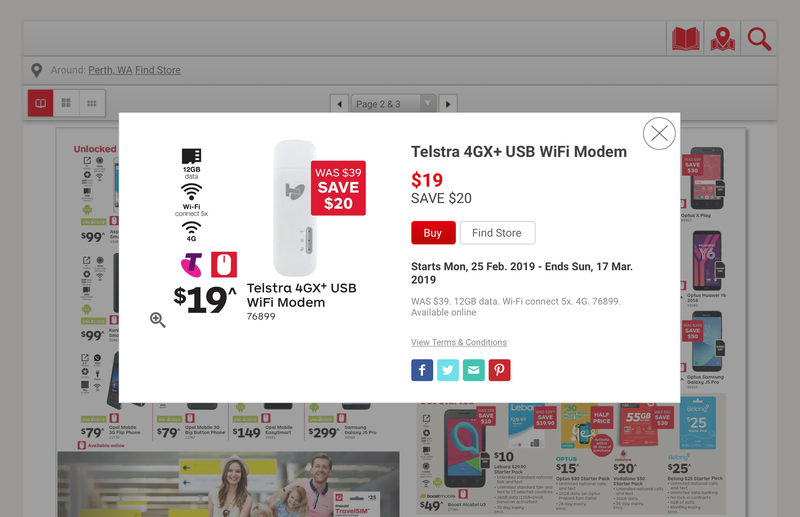 The 4GX USB Wi-Fi Modem from Telstra offers convenient access to Telstra's 4GX Wi-Fi coverage around Australia. Enjoy the benefit of connecting up to 5x devices at a time. Anyone know when this expires? Doesn't mention 12GB on that page though, just says "3GB of data for use within 30 days from date of activation"
Works fine here and shows 12GB of data. You referring to the deal or the data expiry? @0jay: Not really. Plenty of people can do it, especially on a Wi-Fi hotspot. @Porthos: No doubt, point is it’d be unusual to offer that ammount with only a 30 day expiry. Either way there’s no mention of how long the 12gb is good for. @0jay: Thank you for your contribution to this deal, it has been so worthwhile. Sorry I meant clicking the red Buy button in the catalogue. Ah yeah, that makes sense. Doesn’t work for me either. Stated 30d 3GB when purchased - depends on current offer when you activate. I'm glad my Boost SIM worked in this. Just curious, what other telcos would benefit from unlocking it? I just use an unlocked 4G phone & never unlocked this in last 2 years. So it would support all bands Vodafone and Optus use? Good point - Check frequencies in Deal Description. Covers most bands used by all Telcos. oztowers gives number of towers per Telco on each band. So are you confirming a Boost sim works fine with this modem? Thinking of getting it and switching to Boost when the data is out. Will work without an issue. I used mine with an Aldi data sim. The biggest issue with this one (once it’s unlocked) is the support for other carriers 3G bands, as it only supports 3G 850/2100 and the Optus variant of this supports 3G 900/2100MHz. how do you use it as a hotspot? Can I plug it in to power pack/car usb socket and use it by itself? Yes - I've got this device. I use that mainly in the car as it doesn't have a battery, so shouldn't kill it with too much heat because… no battery! OTOH, any interruption you'll need to wait for the stick to restart. Although stated as with 30d 3GB - Depends on current offer. Activated the SIM on 22/2 - Got 60 days & 30GB. Bought it in the Coles / Target $9 deal (with 30d 3GB) nearly 2 years ago! Still haven't got around to unlocking as outlined in that deal as use a 4G phone for rarely needed hotspot. activated by April or May. I have not unlocked any either as have various modems from all three telcos and also use unlocked phones for hotspotting. With so many Cashback & other FREE SIM deals, I haven't paid for Data for a long time (Kogan 99c). Just activated 2 free 52GB 90d Catch SIMs. Others got better Catch Connect deals. Using the SIM from this deal in the FREE 4G Telstra phone. Better to use than this modem (battery to make portable, Bluetooth, screen to read SMS & info, etc - still works as hotspot for multiple devices).